It's time for a new challenge at The Ribbon Girl, and the December theme is Ho Ho Ho. 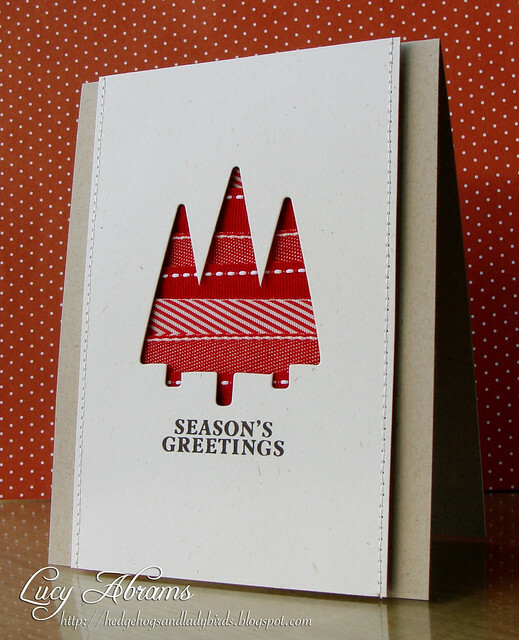 You need to create a Christmas card. Pretty easy, given the time of year, right? So I decided to create another negative die cut card. I used some tree dies from THIS Hero Arts set, and a sentiment from THIS SSS stamp set, along with 3 yummy red ribbons from The Ribbon Girl - THIS, THIS and THIS) By the way, that denim ribbon is simply FABULOUS. Simple, but the ribbon adds so much texture and dimension. Click HERE to see the challenge details, and remember, there are fab prizes up for grabs! a stunning creation Lucy...love it ! Lucy, this is amazing! I'll definitely case this!! I love this. So simple. So perfect! Lucy, this is just so festive. I love that red ribbon and your stitching is so perfect. Love this - wonderful way to use that ribbon. Some digi cards... and some winners!